The UFO has been spotted more than 50 times in the last year, conspiracy theorists claim, yet NASA is yet to mention it. The object has two long wings and a thin tail, which has some claiming the craft is angelic. It was spotted travelling THROUGH the Sun, which would mean it boasts technology strong enough to withstand the 15,000,000 Celsius temperatures at the core of our solar system’s star. 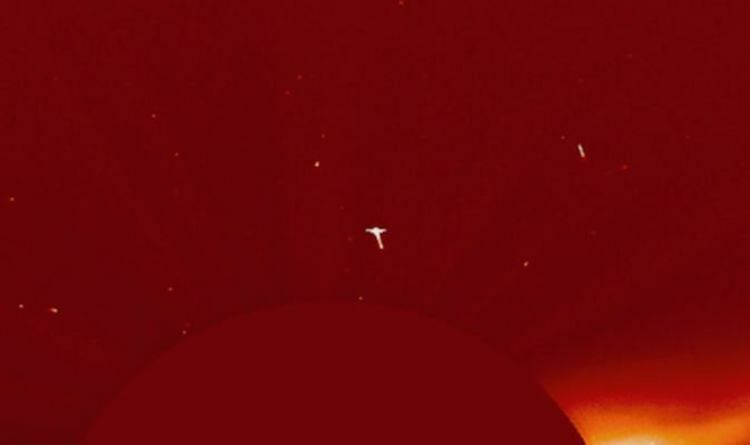 Prominent conspiracy theorist Scott C Waring spotted the strange anomaly in NASA images from its Solar and Heliospheric Observatory (SOHO) satellite. Mr Waring wrote on his blog UFO Sightings Daily: “An angelic object flew out of the sun today on NASA SOHO images taken by a satellite that records the suns changes. “The object has two wings and a long tail, very similar to other such sightings of this angelic space ship leaving the sun. “Yes, this has been seen over 50 times over the last few years. Usually it is heading to the sun, here it is leaving. This is not the first time an alleged alien spaceship has been spotted near the Sun. In early September, Maria Hill from Salem, Indiana, snapped images of the Sun, which she believes show a huge UFO followed by a massive fleet of smaller crafts passing behind. Ms Hill wrote on Facebook alongside the images: “This is what showed up in my camera after I took a picture of the sun in the eastern sky this morning. iPhone 8 with a camera lens adapter.